Dan Gordon is a writer in the business of adapting screenplays for the stage. In England, he created theatrical adaptations of the films “Rain Man” and “Terms of Endearment.” Now he has turned to material closer at hand: his own screenplay for “Murder in the First,” a 1995 film whose cast includes Kevin Bacon, Christian Slater, and Gary Oldman (and one that this reviewer has never seen). Gordon is also a playwright who carries a banner with “social justice” writ large upon it. His 2008 drama “Irena’s Vow,” based on the true story of a Polish Catholic woman who rescued Jews during World War II, began Off-Broadway and made the journey to the Great White Way. Likewise, “Murder in the First” is inspired by an actual event, telling of the murder trial that exposed the horrendous treatment of prisoners at Alcatraz. Some will find Gordon’s crusading on the heavy-handed side, while others will applaud his straightforward rendition of an absorbing tale. 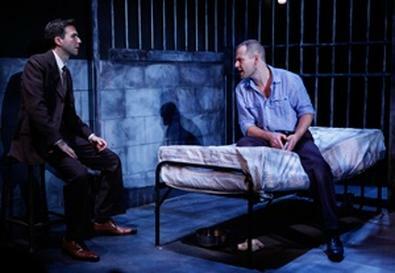 At the play’s center is the unlikely friendship of novice attorney Henry Davidson (Guy Burnet) and condemned murderer Willie Moore (Chad Kimball). Gordon has created sterling roles for these two young protagonists, and happily both Burnet and Kimball, well aware of their opportunities, provide full-size portraits that give conviction and ballast to this feel-good documentary. The setting is 1941 San Francisco, before America’s entry into World War II. Moore, an inmate of Alcatraz, is on trial for murdering another inmate with a spoon. This seemingly hopeless case has been given to the idealistic and inexperienced Davidson. Both his girlfriend Mary (Larisa Polonsky), a public defender, and his brother Bryan (John Stanisci), a successful if slippery corporate attorney, advise him against accepting the job. But Henry plows on, although rather shaken by the uncommunicative Willie’s wish to plead guilty. As Henry learns more about Willie’s notorious treatment in solitary at Alcatraz, the lawyer claims in court that the prison is a co-conspirator and announces that “Alcatraz is on trial!” Said trial becomes the play’s centerpiece, with a roster of colorful characters: the impatient Judge Clawson (Thomas Ryan), the opportunistic journalist Houlihan (Joseph Adams), prosecuting attorney Daren Kelly (Bill McNeill), and the two apparent villains: associate warden Milton Glen (Jim Lorenzo) and warden Harold Humson (Robert Hogan).While the trial’s proceedings are unsurprising, Willie’s loose-cannon behavior supplies some welcome suspense. On Mark Nayden’s sturdy set—Willie’s jail cell on one side, Henry’s office on the other, with the judge’s court solidly center—director Michael Parva moves his large and talented cast of 15 with speed and economy. Predictably, the play is a flow of filmic short scenes until we reach the Capraesque finale. Burnett, a London actor making his U.S. debut, gives Henry both determination and a diffident American charm, while Kimball skillfully creates a contradictory Willie who never becomes a mannered misfit. There is strong support from McNeill, Polonsky, and especially Hogan, with Anthoula Katsimatides touching in her brief scene as a prostitute. The last words of the play are a voiceover that tells of Willie’s fate and that Alcatraz was finally shut down as a prison. The fact that this was not until 1963 rather pulls the rug out from under Henry’s heroic effort, as Gordon again reminds us that American social justice grinds slowly. Presented by the Directors Company, Chase Mishkin, Barbara and Buddy Freitag, and Invictus Theater Company, at 59E59 Theaters, 59 E. 59th St., NYC. June 6–July 1. Tue.–Thu., 7 p.m.; Fri., 8 p.m.; Sat., 2 and 8 p.m.; Sun., 3 and 7 p.m. (No performance Sun., July 1, 7 p.m.) (212) 279-4200 or www.ticketcentral.com. Casting by Judy Henderson.